On our back porch we have two large wrought iron light fixtures. 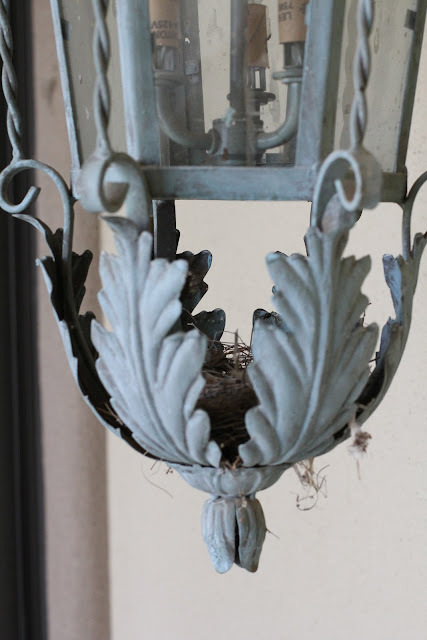 Shortly after we moved in six years ago, we discovered that the local birds loved building their nests in these fixtures. The basket shape at the bottom seemed to be a perfect fit for the small arizona finches. Two years ago, we inherited two kittens, who grew up, and turned into ferocious hunters. After two awful spring seasons with both moms and baby birds being killed, I started putting towels in the baskets to prevent the birds from building nests. Last week, after arriving home from our spring break (and before remembering to put in some towels) Sierra and I noticed two small birds traveling back and forth from one of the fixtures. Then, a mama bird went into the basket and sat down. "Oh noooo!!!" I cried as we went out to investigate. As we approached the light, she flew away. I climbed up, peaked inside the basket, and sighed with relief. No eggs. Yet. But their was this. 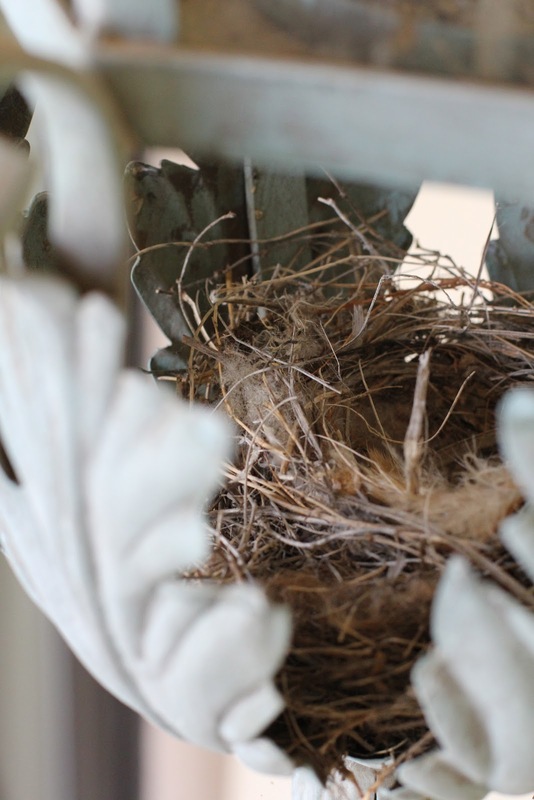 A perfect little nest full of feathers, and twigs, and hard work, and love. My heart sank. I put a towel on top of the nest, climbed down, and turned around just in time to see the mom and dad bird return together. They both flew close to my head, chirping and circling in great distress. It was obviously close to the time when this sweet mamma bird would lay her eggs, and now they had no home. Sierra and I were both in tears. I think it's one of the saddest things I've ever seen. But, I knew that if she laid her eggs in that nest, she would be killed and if her babies hatched, so would they. Finding another home was their only chance of survival. I thought about this all day. I kept trying to work out other options in my mind, but there weren't any. And then it hit me so hard. How often does our Heavenly Father choose to reroute us on our path of life? How often do we think, "Why me? ", "Why now? ", or just plain, "Why?". I've always believed that God directs us in the path that's ultimately best for us (if we'll allow Him). But, for some reason, this experience gave me a clarity that I haven't had before. A perspective of how hard it must sometimes be for our Heavenly Father to watch us hurt, but know that ultimately it's for a higher cause, a better outcome, a chance to live, and a chance for growth. I may not always be grateful for this rerouting, but I am always grateful for the journey. Thanks Terra! Just what I needed to hear!